Loreto Nedlands principal Therese Hussey and students. 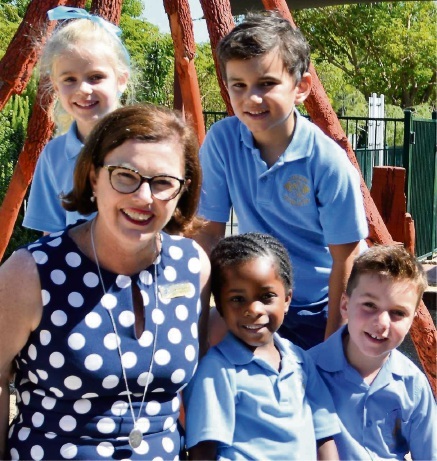 A SMALL, boutique coeducational independent primary school, Loreto Nedlands caters for students from pre-Kindergarten to Year 6. Loreto Nedlands is a progressive school and has had a strong presence in the western suburbs since its inception in 1931. The school is a member of a wider network of thriving Loreto schools in Australia, South East Asia, the UK and Europe. Founded by Englishwoman Mary Ward in the 17th century, the Loreto tradition is built upon the values of justice, sincerity, felicity and freedom. Loreto Nedlands proudly aspires to ensure these values continue to be the foundations of the school environment. It expects its students follow the example of Mary Ward, a woman of great courage, integrity and faith, and the school is proud to have an exemplary female role model for both boys and girls. Loreto Nedlands expects students to live by its values and be the change that they would like to see in their communities and the world. The Blossoming Policy outlines the work the school does in developing students to be critical, curious and creative through initiatives, including character strength work, play-based education and well-being lessons across all year levels. Loreto has a world-class music program with a team of dedicated and talented music tutors who offer individual and small group music tuition for a full range of classical and contemporary instruments. There are also varied opportunities for students to participate in musical ensembles, orchestras and choirs. Loreto Nedlands recognises students require strong, confident and convincing speaking skills if they are to make a change in their world and students participate in speaking competitions, oracy examinations and interschool debating. In order to blossom, it is essential for students to have opportunities for leadership. Students in the senior class have a designated leadership role, either in a Loreto Ministry, as Mary Ward Captains, Faction Captains or as Head Boy and Head Girl. At Loreto, the Head Boy and Head Girl positions are rotated each term in order to provide quality leadership experiences for many students. The Loreto value of justice is reflected through a range of outreach initiatives in which the whole community participates. Loreto Nedlands supports Loreto Vietnam with a variety of fundraising initiatives and provides ongoing support and staff training for St Joseph’s in Wyndham in the Kimberley region. The school also hosts the annual St Joseph’s Camp and enjoys opportunities for the senior students from both schools to build friendships. Principal Therese Hussey welcomes all families to join a school tour or ring the school to organise a private tour and experience how students are “blossoming” at Loreto Nedlands.